Imaging Orion from the Donald C. Martin ObservatoryOur local astronomy group and high school are very fortunate to have a wonderful astronomical tool at their convenience. Unfortunately, it is severely underutilized and I am also guilty of not putting the tool to use as often as I should. So recently after a public observing night, I committed to imaging M42 from the dome. The observatory houses a 1970's vintage Celestron 14" Schmidt Cassegrain telescope. The scope still performs marvelously and was refurbished a dozen years or so ago. The scope is housed in a similarly aged Ash dome. 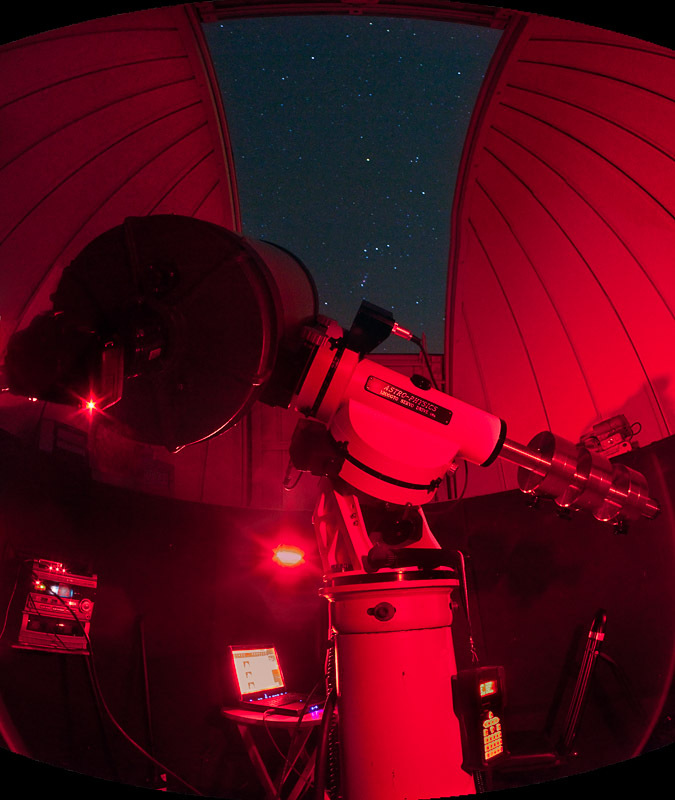 What has really made the scope perform wonderfully is the relatively new Astro-Physics 1200 GTO mount. The mount was made for the rather bulky C14 and the two perform flawlessly together. The dome is located just south of the main city limits of Huntington, WV and is victim to a fair amount of light pollution. But recent developments in DSLR technology and filtration have made imaging some objects from the dome a workable situation. My recent experimentation with the new crop of DSLR's show amazing signal gathering without a compromise in noise at ISO's as high as 6400. 6400 ISO is nuts...right? The DSLR manufacturers have really come a long way in their software/hardware combinations to improve signal while reducing noise. Combining this type of camera sensitivity with a light pollution filter permits imaging of certain objects in the hydrogen alpha range of light. I won't go into detail about all of the technicals around this, but basically most astronomical objects glow at the magical hydrogen alpha line of light and fortunately most of our light pollution does not cross that wavelength and can be filtered out. So I will post separately my first image from the D.C. Martin Observatory and I look forward to working more frequently with such amazing equipment. I believe I can fulfill many artistic objectives with this gear in the future.